As Iran goes through the tumult of a contested election, the turmoil within elicits hope that the "managed democracy" of Iran will be swept aside and replaced by a more genuine democracy…the hope that Iranians will ditch the rule of the mullahs and set up a new government much more like the new Iraq's. Although I in part share that hope, there are good reasons for doubt. The founder of the current State of Iran, Ayatollah Khomeini, had a powerful intellectual ally in paving the way for the current Iranian theocracy: Sayyid Qutb. As explained below, Qutbism has a reach and hook that all-but assures it will not go away anytime soon. 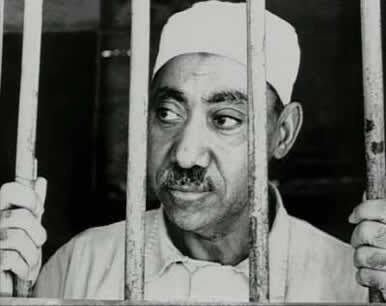 It's already well known that the writings of Qutb are patristically connected to al-Qaida and other Islamist terror groups. As Dinesh D'Souza pointed out in The Enemy At Home, Qutb is known as the brains behind bin Laden. What isn't as well known, though, is the kind of totalism inherent in Qutb's system. The man has managed to nestle an outright ideology into Islam. A Qutbite would likely be amused at me putting it that way. According to Qutb, as summarized by Albert J. Bergesen in The Sayyid Qutb Reader, Christianity is ridden by a fatal flaw. The central dogma of any kind of Christianity says that Christ is the son of God, and therefore both God and man. His mission on Earth was to save all people from their sins, largely through spiritual purification and bearing mission. Anyone who does either is following Christ, provided both are done in a manner not inconsistent with sacred scripture. That supposed flaw in the Christian faith is the belief that God intervenes in this world, and that some existing processes of nature are direct evidence of God's handiwork. It implies that the believer runs the risk of imperiling his or her soul through studying the world – i.e., through going into the sciences. A believer and scientist either has to cultivate blind spots, become skilled at mythologizing with present science should a finding embarrass the faith, or seek refuge in secularism. A Muslim, says Qutb, does not face the same obstacle in the sciences. That's because, when the Muslim's God created the universe, He decided to not interfere with its workings. Consequently, no natural process is evidence of God's work; it's merely evidence of an earlier state of nature. Thus, in Qutbism, the Muslim God is like the God of deists. Qutbite Islam is not quite deistic, however…particularly with regard to one crucial point. As creator of the universe, the Muslim God has sovereignty over it. This codicil may seem deistic, but Qutb uses it to justify full-blown theocracy. He does so through claiming that "there is no other God but God" implies that there is no other sovereign entity but God. Sovereignty, according to Qutb, is reserved for God and God alone. Consequently, any political organization that does not formally crook the knee to the Muslim God – meaning, does not explicitly permit or impose Koranic and sharia law – is at odds with God. Any such polity is either ignorant or in defiance, because only the Muslim God can be truly sovereign. All else must submit to something, including to the Muslim God if fully aware of Him. This argument implies something other than the limited government that deists tend to favor. To be more specific, it implies that the highest kind of government is an outright Islamic theocracy. The kind of "submission" that Qutb enjoins is abjuring the right to make laws. A properly submissive government merely implements Koran and sharia law, and applies both to the times. The Muslim God alone has the right to create laws for creatures that comprehend His existence, because it was He who created the universe. It's creator's right. To sum up, Qutbism is Islam-rooted theocratic deism. This combination of elements, which we consider profoundly incompatible, makes it somewhat strange to us. And also, gives it a real attraction to any Muslim that's in the sciences. Through accepting Qutbism, a Muslim scientist feels entitled to look down upon non-Islamic scientists as being partially befuddled. Since Islam considers non-Muslims to be inferior, Qutbism explains away a paradox that would otherwise incline a Muslim to think of the sciences as ignoble and eschew them. The more Qutb is read, the clearer it becomes that Qutbism is a full-fledged ideology. All the elements are there: a root in a few postulates that are all-but unquestionable to the target audience; deductions from those principles which lead to an "ideal" form of government where self-rule is banished; a system where further clarity is achieved through individual learning, reasoning and reflection; and, a crucial point of pride which enables members to look down upon non-members regardless of relevant facts. Qutbism has it all, including the paradox of individual enlightenment leading ineluctably to individual subordination. Strangely, Qutbism is compatible with many form of government, even a "managed" democracy. All it takes is the rulers and State being subordinated to the laws of the Muslim God by imposing Koranic and sharia law. It's even possible to deduce that Koran- and sharia-compatible anarchy is the highest form of Qutbism, because the highest caliber of believers would not require a government at all to enforce subordination to the Muslim God. Granted that Qutb's system is rooted in orthodox Islam, so comparing it with a secularist ideology isn't exactly valid. However: Qutbism's universality, its targeting of a specific slice of humanity, and its accessibility to ratiocination, makes it an ideology similar to Marxism in terms of reach. As noted in the beginning, there's even a State that can be called Qutbist: Iran. The above may seem compatible with the notion that there's a new Cold War a'brewing, featuring a Judeo-Christian bloc facing a Muslim bloc and the rest of the world being fundamentally non-aligned. As Dinesh D'Souza pointed out, though, this forecast makes a deadly concession: it bestows upon Qutbism the mantle of "real Islam." Given the aggressiveness of Qutbite terrorists, doing so wouldn't be in our best long-term interest. It might also let down the rulers of Muslim states that are currently our allies. If Iran is the new Soviet Union, and Qutbism is (in the sense meant above) the new Marxism, the U.S and its allies have a chance to learn from mistakes made in the Cold War. The pushme-pullyou two-step of unsuccessfully invading the U.S.S.R (1919), and later welcoming it in as a needed ally (World War 2), was a major factor in giving the Marxist ideology its range over the world. We have a chance now to treat the Iranian state in a way that the Soviet Union should have been treated: left alone, but carefully sequestered from the rest of the world. Happily, the policies of the former Bush Administration managed to achieve this goal. Of course, Qutbism is politically aggressive; it even roots its aggression in following the footsteps of Mohammed. According to Qutb, there are three stages to a Muslim takeover: the Muslim God forbids fighting for the faith; then permits it; and then, mandates it. Someone that takes this part to heart is not going to be conducive to live-and-let-live global peace. There is, though, a solution. As related in The Enemy At Home, al-Qaida and other Qutbite anti-American terrorists began going after America – "the far enemy" – because supposedly apostate Muslim governments – "the near enemy" – proved too strong for them. The solution to keeping Qutbists down is deterrence. If Qutbite terrorists find out that the "far enemy" is too strong too, then they might wind up taking up "properly Islamic" science fiction. That would enable the West to continue extending open arms to Muslim communities and countries that are not our sworn foes. Daniel M. Ryan blogs these days about low P/E stocks.